The Yawkey House Museum garden is breathtaking in its splendor and is perfect for a May through October wedding ceremony or outdoor event. 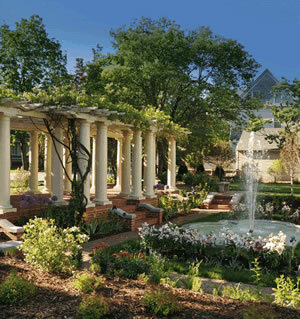 The gorgeous flowing sunken garden with its dramatic fountain focal point framed by a vine covered pergola is the perfect backdrop to celebrate any milestone in your life. The newly restored carriage house provides the perfect indoor space to stage a catered buffet for your guests. The quaint building is a memoriable setting to any occassion. Rental is for three hours and includes the vibrant garden area as well as the charming and functional carriage house. The alluring space is the perfect gathering spot. Services of an on-site MCHS representative. Three hour site rental for ceremony or reception. Set up and take down of 25 beige folding chairs. Lovely backdrops for your wedding photos (photographer's permit is included). Electricity is available for soft music. No amplified music is allowed. Use of the Carriage House for Bridemaids and Bride to walk into the garden. NOTE: There is a $50.00 charge for any part of an hour after the 3 hour limit. Request a rental packet above or call (715) 842-5750 to reserve your unforgettable moment in time.